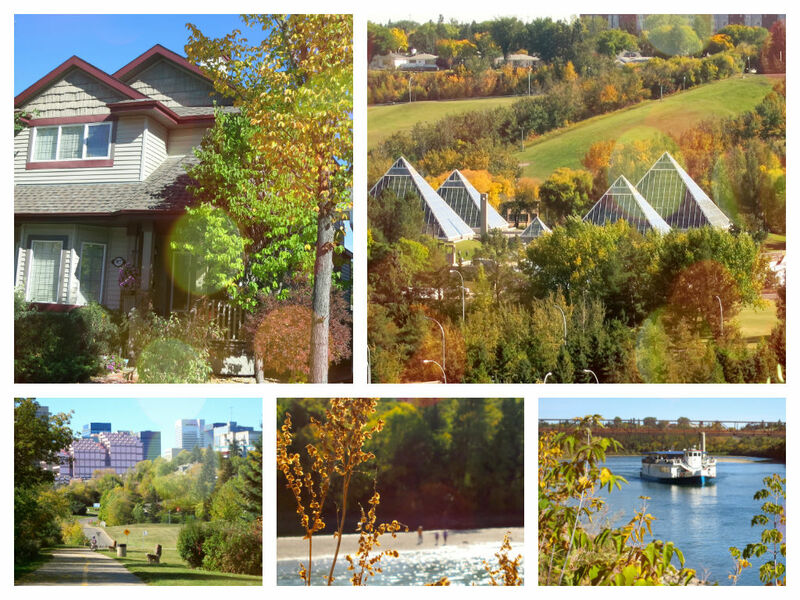 We’ve been enjoying a spectacular Fall in Edmonton with warm days and beautiful colours everywhere. It’s typically time to think about ‘Fall cleaning’ and all that entails. This year, for me, it’s a little busier than usual. We’re emptying a storage locker, trying to decide what to keep, what to give away and where to store everything. 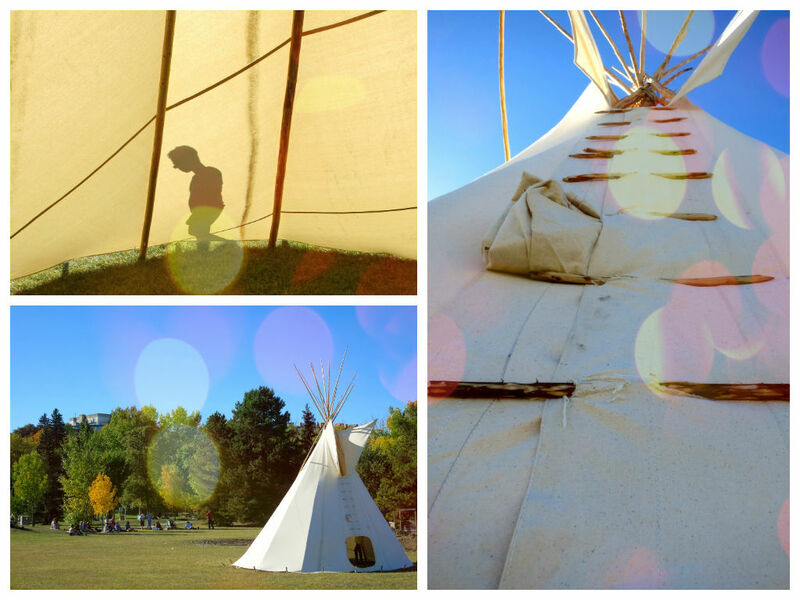 So when I came across this Teepee at our community park, it got me thinking. The simplicity seemed very attractive. Tree branches for pegs means you’ll never be ‘missing’ one. A simple flap for a door, affords a pleasant view of the great outdoors. The handy sunroof, lets the sunshine in or a beautiful view of the stars to enhance your dreams. I suppose you could tuck away a few of your favourite things in a sack, but there’d sure be a lot less dusting and cleaning. Am I right ladies? Honestly, some days, just a few good friends and some music is enough to fill your soul. Then again, I hate to beat on the same ol’ drum (excuse the Teepee pun), “life can not just be about the necessities”. I think this Teepee could do with a little bunting. Can’t you just picture it? A Boom-Pee-Tee? I’m not a professional Teepee decorator, but I think that does make it a little more Boomdee-ized (yes that word). Where would I get such a glorious thing you ask? From the lovely and effervescent Dani at Teddy and Tottie of course. As you may or may not know, I recently ordered mine in my favourite colours and the parcel arrived two days ago. I opened it with giggles and squeals the whole way through. Not only did I receive the beautiful hand crafted bunting, Dani sent TWO!! She also included lovely, lovely treasures, wrapped in pretty sea foam and pink doilies and string, that have filled the Boom-Room with love. Thank you so very much Dani! You have spoilt me at every turn. I honestly can’t stop looking at it, I think it’s too adorable. Who am I kidding, simplify and live in a Tee-pee? My momentary silliness vanished without a trace the moment I strung my cheery bunting. I could live with less, but that’s no fun at all. Do you think you could pare down and live in a Tee-pee? I think the first thing we need to establish is whether they make them in aqua! Uh – no! Not even close! I just built a wall of closets for stuff we can’t bare to part with…sigh. I love the title of this post it makes me laugh!! I love that cat scissor holder thing you have. SOO CUTE! Well, i am currently living in half my house right now, just the main floor, and it’s ok. But it isn’t as much fun and everyone else in the house seems SO MESSY because i am tripping on all their crap. However i have also gotten rid of furniture i didn’t want to part with AT ALL and once it was gone i felt no remorse whatsoever only better to have less. I know that when i put my kitchen back together i will be parting with more dishes etc that i haven’t used in forever, and that is so freeing. I also pared down all my knickknacks and I love it. Stuff makes me crazy when you really think about it. Cleaning is the bane of my existence and i hate that. I like Pam’s Comment above – LOL. I am with her too. Aren’t those kitty scissors so cute? Dani sent them from Australia. How spoilt am I? Really, I’m a girl ordering irresistible flower-petal bunting. It’s possible I just answered my own question, LOL. Gads, you poor thing, I can only imagine the noise and disarray. Keep you eye on the prize. What about a giant box in the garden shed where you collect anything that you trip on more than a couple of times? Before you know it, things will be picked up, HA. I hear you on the furniture thing girlfriend. Congratulations on breaking the habit. We purged before we moved. I too had a hard time parting with a couple of nice antiques but they went to good homes. I’m actually going for more transitional decor in this house. Kind of Sarah Richardson decor. A couple of nice older things surrounded by newer, streamlined, less fussy furnishings. That’s the plan anyways. My craft room will be the exception. That’s were I’m indulging my Whimsical side. Hey !! Maybe have a break away room that is just yours where you can pile on the fun. The deal I made with Mr B when I left work early was to do all the laundry. So now I’m 8 years into that little deal and sometimes it’s the pits…ha! I used to dream of living with only what I could carry in my backpack! Ah the visions of the young 🙂 but even then, I thought it important to live simply. HA! So says the woman with a truck and a Harley in her carport!! But I digress … your photos are beautiful! You are a good bit ahead of us in the leaves turning department. I do love fall! What a lovely gift Dani sent to you! All of you crafty girls are so talented!! Ya, remember when we didn’t have anything cause we didn’t have any money? That wasn’t too bad because we had our *youth*, LOL Just flying by the seat of our Levi’s. Our last home was rather full of things I’d accumulated over the years. We purged and gave away a lot but still seem to have a lot. I’d like to live more simply but don’t want to let go of certain things that have good memories attached to them. Even if it’s just a rock I picked up while snorkelling in Maui. Woe is the poor sole who has to do it when I’m gone, LOL. They’ll be saying, “why the heck did she need all this stuff, look! a rock”…haha. I agree, Dani’s one talented sweetheart, I tried to learn how to crochet but couldn’t remember after 1 day. 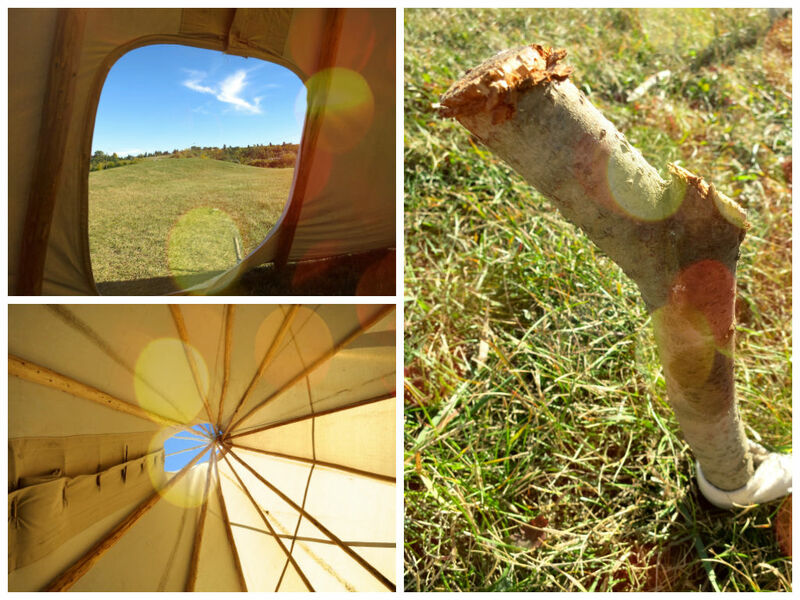 Living in a Tee-Pee with only the bare necessities??? Well, ah, uhm…NO! Only in times of armageddon and ovra disaster and I would be whining and crumbling and complaining all day long. We have camped a lot and taveled a lot, much to my delight and pleasure. First thing I did/do when arriving in hotels or after setting up tent, was create a nest with personal things and a pot of flowers of any kind. Oh and than the glory of coming home again, tiptoeing through house, humming and smiling and dusting and touching all my stuff again! Love the Bbomdee touches and it is clear to see how happy you are with Dani’s package! I think you’re in good company Johanna, not a single reader wanted to move into a Tee-pee any time soon. Right you are though, could do begrudgingly if said armageddon required cut backs, HA. But it would not be without ample tears for what was once before. I love you ritual away from home. flowers are so sweet. I do a similar thing with a candle. I take a nice scented candle with on Holidays to light in the room in the evening when we enjoy a glass of wine. Once home, we can light the same candle, enjoy the scent of our recent vacation and reminisce. Hotels can be so same same. I agree, a personal touch makes it feel a little cozier. It is always nice to arrive home, safe and sound to all things familiar and of course our pets. Man I miss them when we’re gone, I know you feel the same. What gorgeousness!! How on earth do you do an animation with a real photo? I could live in a teepee easily if it was necessary, but like you I do enjoy my “stuff”, it makes my house home. Thanks a bunch for your nice message. The Boom-Tee-Pee of my dreams is composed in Photoshop. You’re able to add layers from several different photo’s. 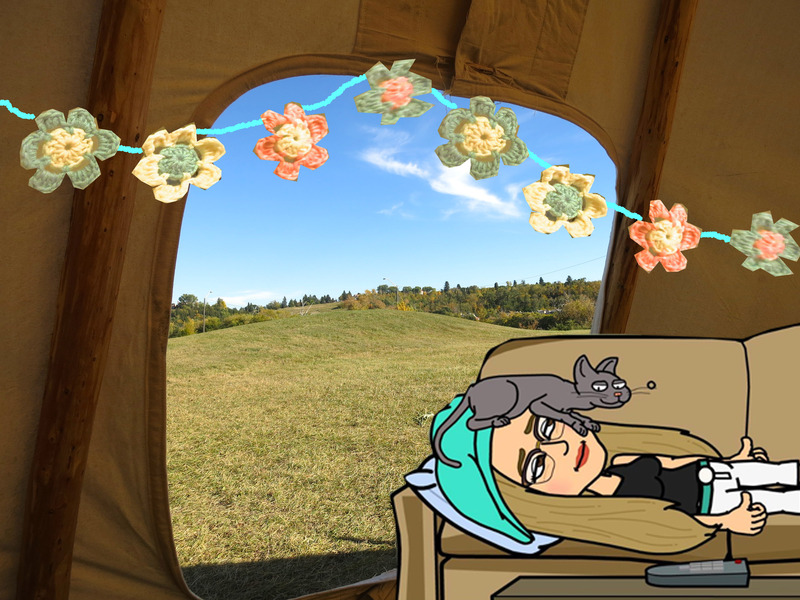 I cut out the bunting from one photo, cut out the cartoon from a Bitstrip and layered them onto my Tee-Pee photo. You can get a free trail at Adobe Photoshop for 30 days if you ever want to try it (like you won’t be busy enough earning a living). Yes, high five for pretty nests 🙂 I could never, ever do minimalist, I have tried to declutter a little but it’s all important memories or found treasures – none of it worth much financially but I collect things because I love the look of them, they bring me pleasure. 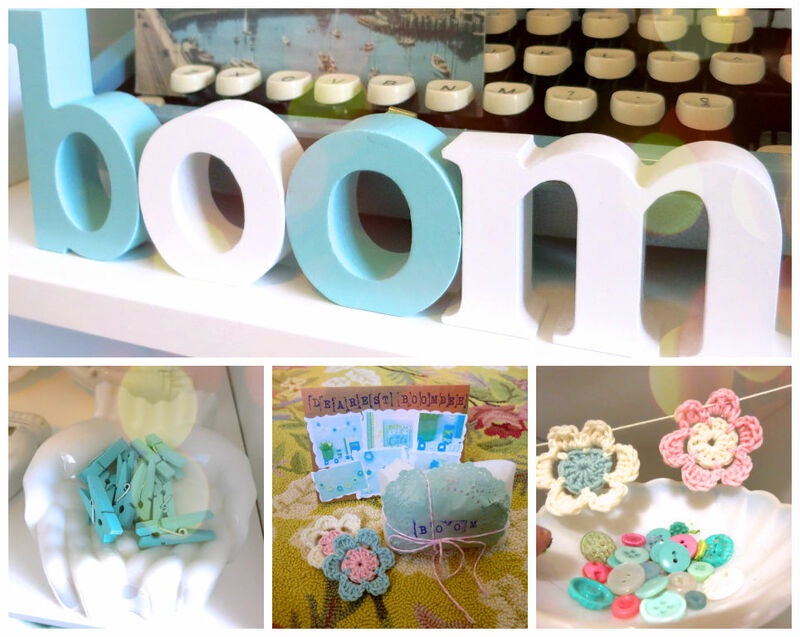 Well, you most certainly are “The Cat’s Meow”, dear Boomdee, featuring my little parcel of bunting in this gorgeous post. I can’t believe you received it so soon after posting. The carrier pigeon must have had a mighty tail wind over the Pacific! I do tend to go a little crazy, don’t I, and am slightly concerned I have added to your “stuff” when you are trying so valiantly to pare back. (And, there is another package heading your way soon with a pressie for a dear friend – so more stuff I’m afraid). Good Morning Dear Aussie Wonder Girl xoxo. Please DO NOT fret one single moment over adding to my ‘stuff’. Everything was simply glorious ❤ You've brought that special Aussie sunshine to the Boom-Room and I just loved every little thing. I'll watch for the next package of secret goodies then too. My gosh, that was a fast project ! Your wee fingers must just be flying like the wind. HA, I hope your kitty cat's don't feel too deprived of attention while you manage it all. Giant hugs to all your fur balls of love from lil' ol' me, Petals & Blossum too. Funny, I noticed the bubble wrap was also a lovely aqua colour too, LOL. I took photo's but they were too shiny. (( You're )) too sweet ❤ It was all delicious and looks spectacular in the Boom-Room. It makes me feel cheery when I look at it, especially because I know it was made with love by you. Congratulations on doing a purging and I'm certain others were happy to be the recipients of these things. Recycling with a generous heart is definitely a win/win. It's a good way to make room for the new things bring joy to our days. BTW, I hope you billed enough postage ! I feel like you haven't ?? I hope your sweet Etsy shop isn't in the Red since your parcel was so, so much more than just the bunting. Please make sure !! Absolutely not! I’ve pondered this before, but no. I need a large kitchen…a real bedroom (being a major klutz and afraid of heights, a loft is a no-go! )…room for my studio and library! Plus Ben. With all of that, is there room for our poor collie to even lie down? I can’t blame Blossum for being nervous! Hi Jen, how nice to see your message tonight, thank you. I must insist, Ben needs to be able to stretch out, maybe even race around doing zoomies. If he’s anything like our pets, He’d be happy anywhere you are. I know what you mean about a studio, I’m getting royally spoilt here being able to decorate how ever I want. My Boom Room is small but it’s mighty. Your photos make it all look so inviting. Even your view from the teepee with your bunting hung. 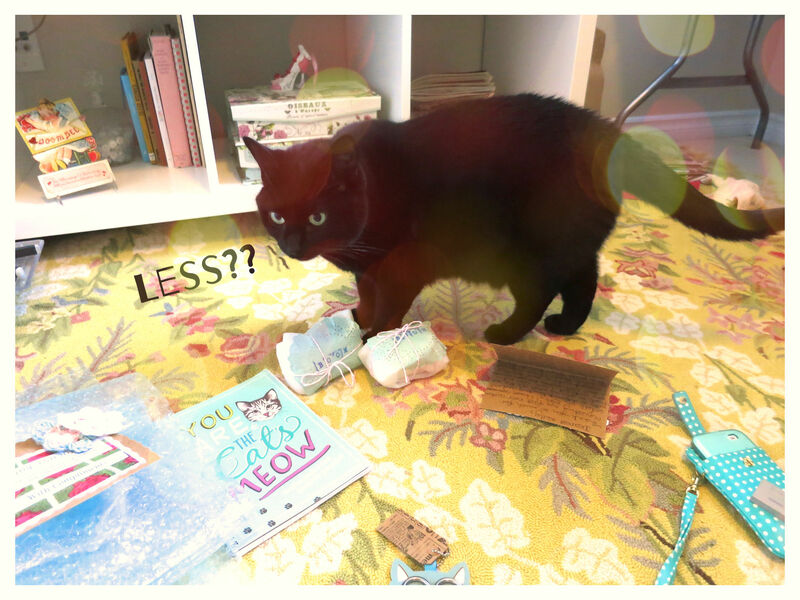 If you had less, what would Petals and Blossom have to play with? I think the first Native crafter ended the idea of minimalism after she went to the forest and collected all her goodies for crafting then hung them all around the inside of her teepee. We with creative hearts will never be minimalists. I’ll keep the storage unit until I use up every bit of my art supplies. I’m with you. More is better. BTW, my idea of camping is a Holiday Inn that doesn’t have room service. No teepees for this girl. I’m wired for luxury. I am always amazed with how clever you are presenting photos and playing around with effects – it looks really professional! Dani’s flower swags are just lovely and she has inspired me to look outside the square a bit more when I begin the reorganisation of my art space. Dani is also SO generous with gifting on more highly appropriate items for the Boom Room – it must be absolutely scrumptious in there already! Your autumn colours are very pretty – but it doesn’t seem that long since you were coping with enormous white-outs and freezing temperatures. I guess time is just racing past faster and faster. We don’t get so many fabulous colours herein Autumn as most of our native flora is evergreen. It is only where there are extensive plantings of exotics that we can really enjoy that particular scenario. Maybe in summer if I had about 4 ft of soft bedding on the floor but winter? You have got to be kidding me! ;). LOVE the bunting Ms Boomdeedaizee and Ms Teddy/Tottie is one clever minx. Talking about minx, love the cat (Earl sends “hugs” 😉 ). Oh, I love all your pics Boombdee! Looks like a beautiful fall over there. Here, it has finally become warm again, but don’t think it will last beyond next week. I have been mulling over living with less for years now and am ready to take the plunge. I feel very ‘done’ with living in a sprawling metropolis, and am ready to move outside a city or in a much, much smaller city. I’m looking for work, so that will obviously dictate the ‘where’ but I know that it will not be in a large downtown location anymore. !! Oh, thanks for sharing your exciting news Catja !! What do they say? Change is as good as a rest. There’s certainly an appeal of living in a smaller community. I hope there’ll be creative and artistic souls like yourself there too. We kind of went about it the opposite way, but love living central. There’s a real community spirit here, many residents share a community garden plot all summer. The gal doing the singing on the weekend, has just moved into the neighbourhood. I happened to meet up with her the next day when we were out for a walk. She’s just as sweet as she sings. I like all the young people that live in central areas. There’s just a different vibe than out in the suburbs. People aren’t afraid to be unique or do interesting things and I see creativity at every turn. It’s pretty vibrant in downtown Edmonton these days. With Farmers markets and Bistro’s and Deli’s and Bakeries. I think It has a small town feel if you know how to get around. D’aww, you’re too kind :). I’m happy that you enjoy where you are living, it sounds like a wonderful city! Niagara on the lake is very pretty, I went to school there for a bit. You are so fun and funny! That is quite the teepee, but like you, I enjoy the little treasures from life that make things feel like home: a vase of flowers, a potted plant, framed photos and little treasures from friends, travels and life. 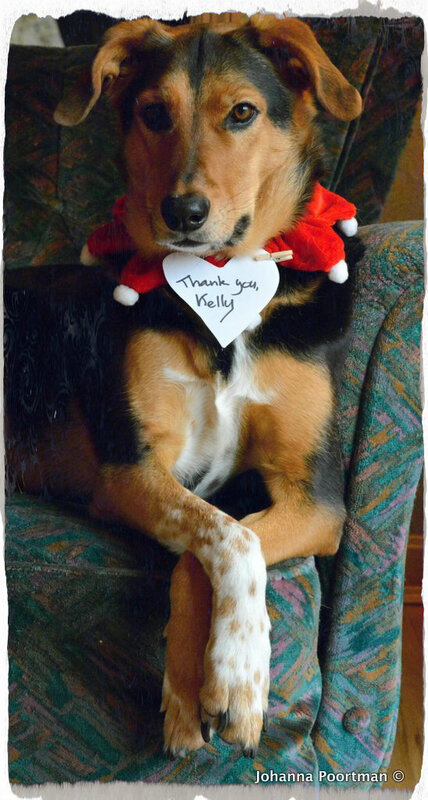 I love your photo-doctoring. Your Bitstrip gave me a good giggle. Dani is indeed talented, kind and effervescent. What a lovely collection of treasures and all so beautifully you. 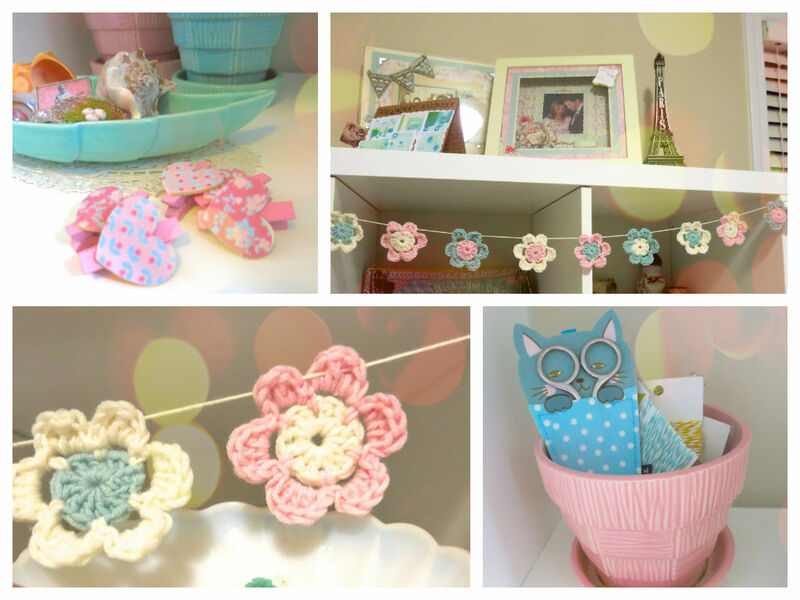 I love the soft colors in the bunting and see they work so well in the Boom Room. Did she send you those letters, too? And the kitty scissors. So CUTE! You’ve captured the essence of fall in all your outdoor pictures. Such stunning vistas. 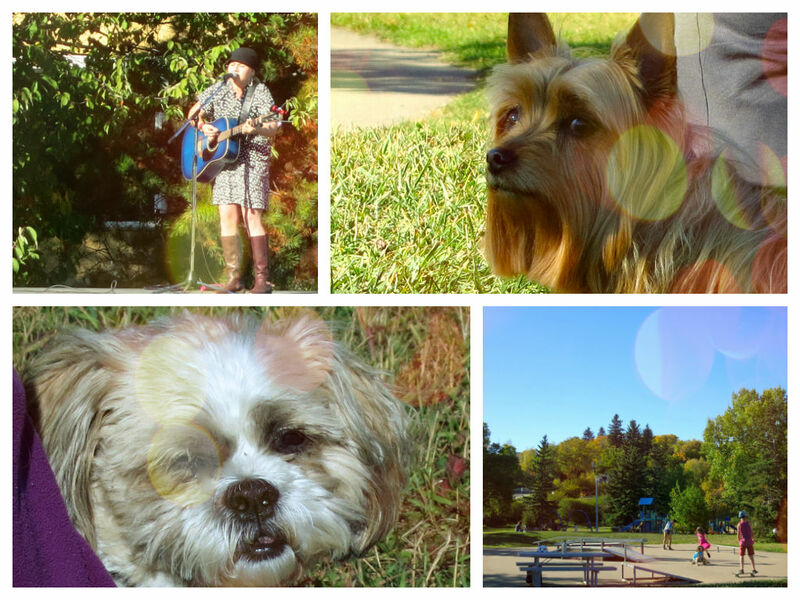 I hope you can squeeze lots of fall days into the mix before winter descends. It’s looks so fresh and inviting…like you. Hello cuteness, didn’t I mention you’d be staying in our guest Tee-Pee? I shall do it up like Karen Blixen’s lovely camping tent in Out Of Africa. Remember when Robert Redford washes her hair for her? Well, he won’t be here but I’ll get out the fine English china and linens. It’ll be easier for us to sneak out at night, LOL. Did you ever do that as a teen? Sleep over in a girlfriends tent and when the parents were asleep, wander around the neighbourhood?